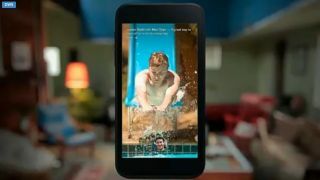 Facebook has unveiled an enhanced experience for Android, taking things beyond the standard Facebook app. Facebook Home essentially acts like an overlay for Android phones. Among other things, it replaces the lock screen and the home screen of your Android phone with the Facebook 'Cover Feed'. Facebook Home is essentially a Facebook OS by stealth. After Facebook Home is launched on April 12, you'll be able to download it from the Google Play store. You can opt to just use it once or have it on your phone continuously. Facebook says that Home will have a new release every single month. And, naturally it will also be available on the brand new HTC First, which has Facebook Home preloaded. Mark Zuckerberg opened the event by joking around the Facebook phone rumours before explaining the event was about "how you can turn your Android phone into a great social phone...we're not building a phone and we're not building an operating system, but we are building something that's a deeper experience than an app". Zuckerberg said the reason for developing Home that people spend 20 per cent of their phone time on Facebook, a figure that rises when you consider Instagram - incredible when you think about it. This is essentially how the overlay works - a layer between apps and the Android OS. Facebook Home will launch on tablets "within several months" - the company is working on it. Cover Feed is essentially a stream of stuff - status updates, new Instagram photos, event invites and more - all navigable with photos. If you see a photo you like, you can Like it or add a comment. Comments are all in-line. Cover Feed relies on simple gestures - "it's the content first" said the demo man. As Facebook says, it "lets you stay up-to-date on your friends' latest activities in real-time, all the time. While Cover Feed aims to show you the most important things, Notifications still show you the crucial things. Facebook wants to shift focus away from apps and onto content, but it has also built an app launcher. Apps can be bookmarked or organised by alphabetical order. You can even post a status or check-in from here, too. Notifications from apps and friends appear right on your home screen. It's easier to see when you have a missed call, calendar reminder or new message. Open a notification with a double tap or clear them away to see your Cover Feed. You can choose what's on your app launcher - press and hold an app then drag it anywhere. Chatheads are a way to take away the dilemma of switching away from an app when a message comes in - you can pop right into the conversation over the app you're using or webpage you're browsing. Various reports before the event suggested that Facebook Home might or might not debut alongside a handset built by HTC running a forked version of Android or more likely just a special version of its Sense UI that puts Facebook front and center. It looks like it may be called HTC First. Zuckerberg has previously said that Facebook wouldn't launch a phone itself, saying that a smartphone "really wouldn't make much sense for us to do."